This weeks project wasn't a load of fun. It was too nice to build a new floor mat for my office - had to be outside. It was cold but that was a good thing. 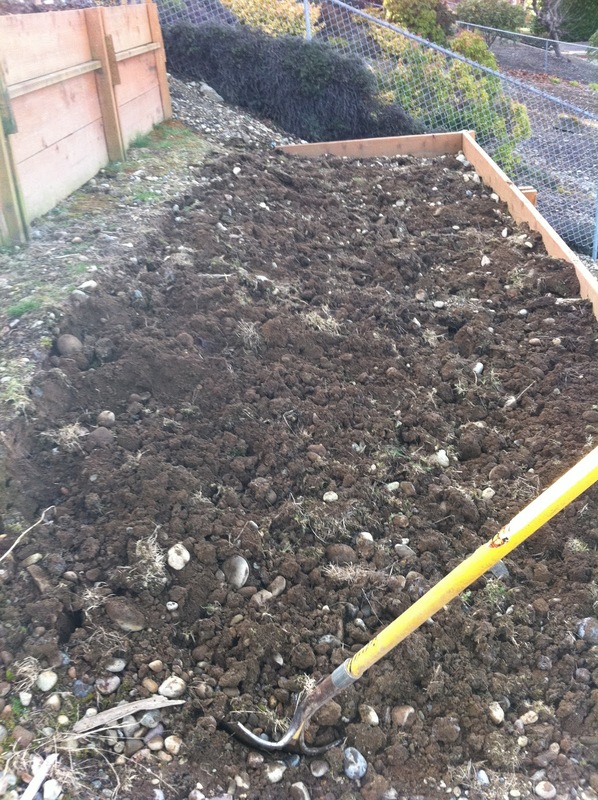 My project was to dig up the garden bed to prepare for planting. I dug both the old one (which was easy) and the new one (which wasn't). I live on glacial moraine. That is the crap left over when the glacier retreats. 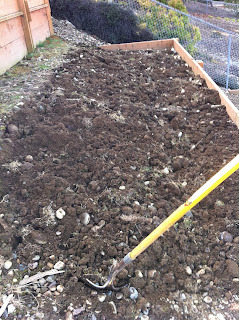 Not the good soil mind you but basically the rocks and clay. 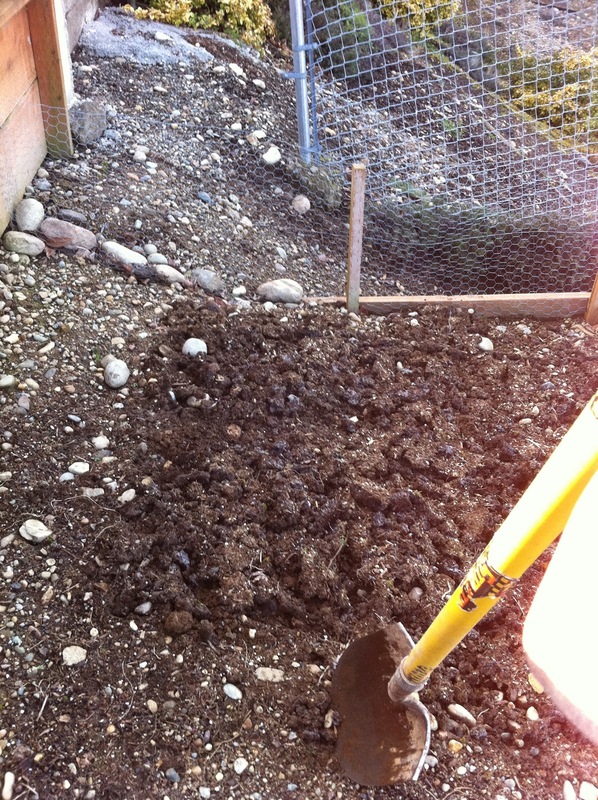 To garden I've got to loosen up the moraine, break it up, put in top soil, and compost. The first step is loosening up the soil. 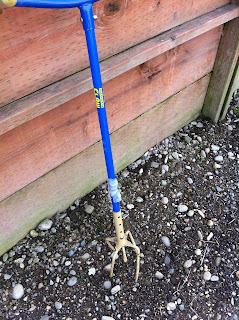 I use a shovel (and at times an adze/pick combo made for breaking up concrete). It's like digging rocks. This is compounded by whoever was the developer for our neighborhood. S/he basically used my yard to dump concrete waste and the stuff he excavated from other homes in the area. I've got double the rocks. And concrete. And old nails. Upper bead after. I know - doesn't look much different. The plants appreciate it. 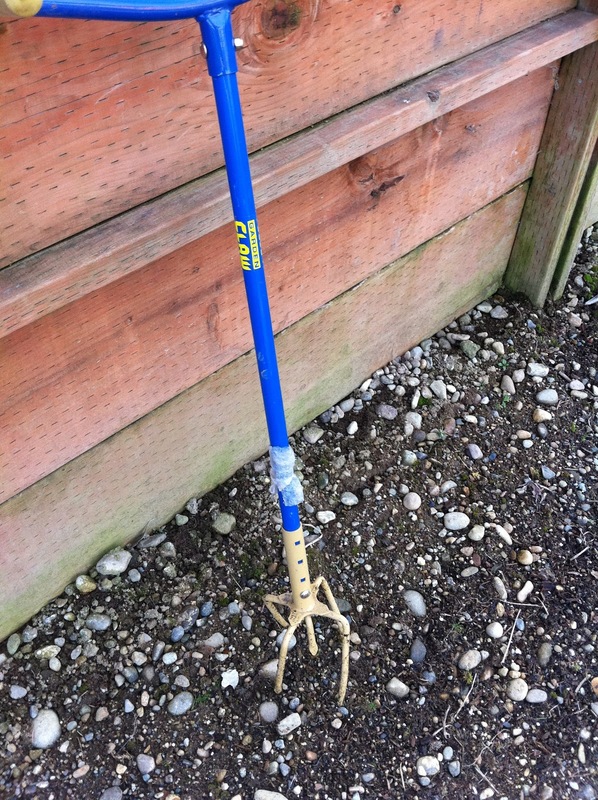 I tried using this beast but the shovel was more efficient. 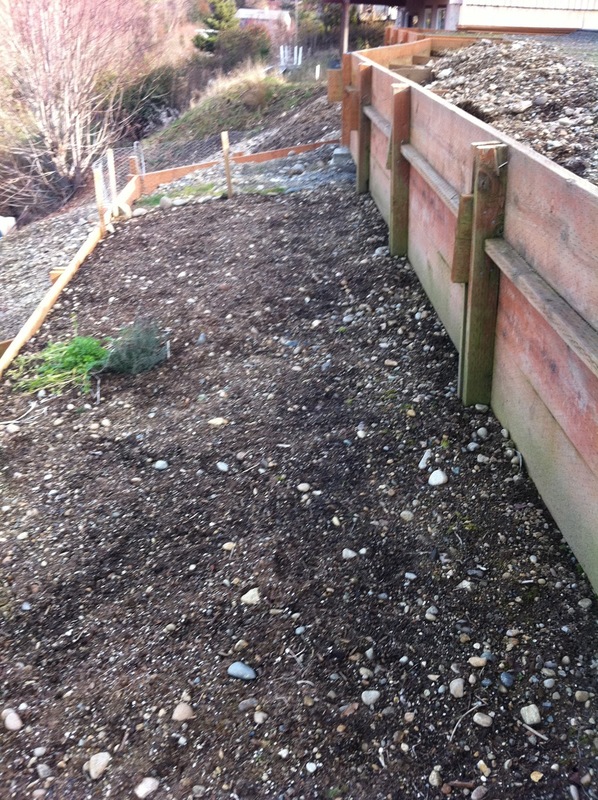 From a few weeks ago here's the before picture of the second bed. 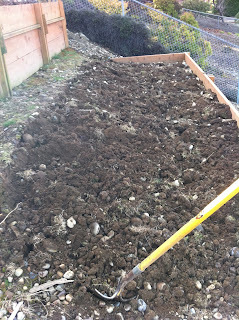 It still needs a raking and top soil - give me a week. Off to stretch out and then a soak in the hot tub. Lately Dawkins has been slowing down - I think there's a problem. 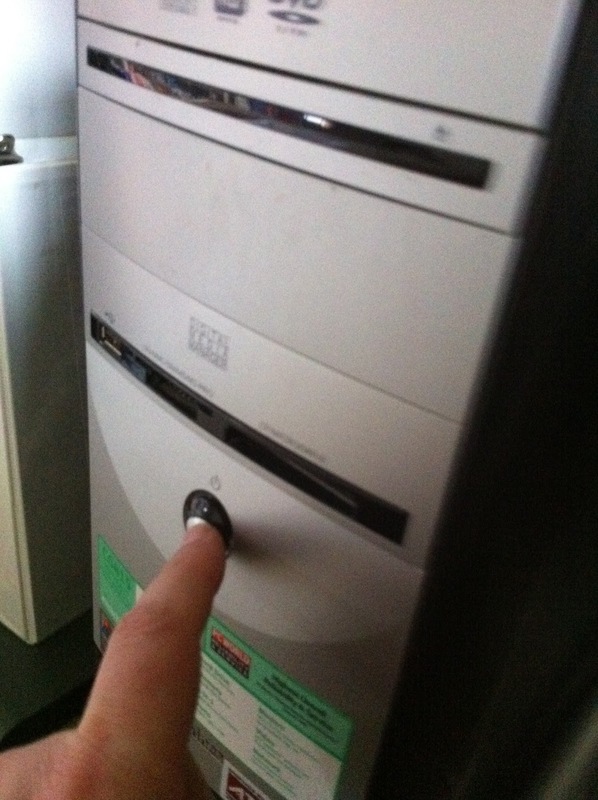 As the picture shows Dawkins is running out of hard disk space. My experience (and Dawkins is just reaffirming this) is that when linux machines get low on hard disk space performance degrades. Disk swapping etc I guess. So it’s time for an upgrade. 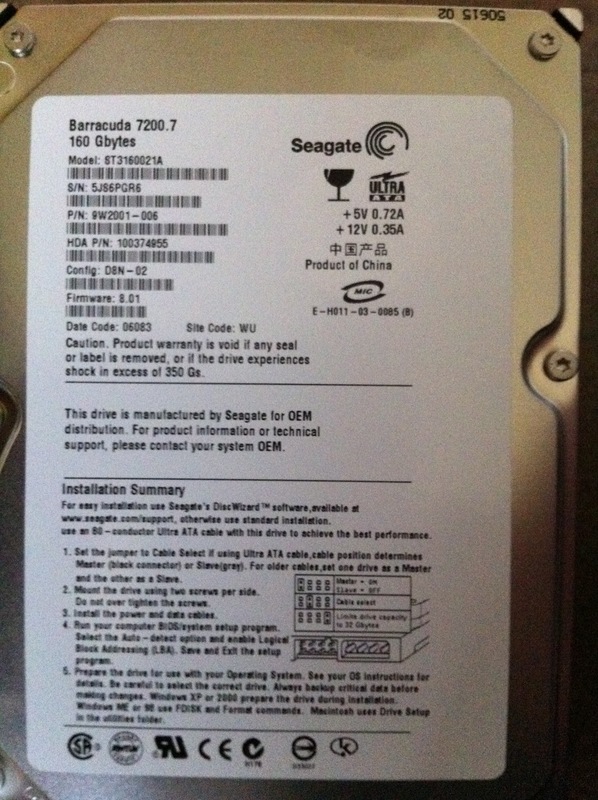 What kind of drive do I need? 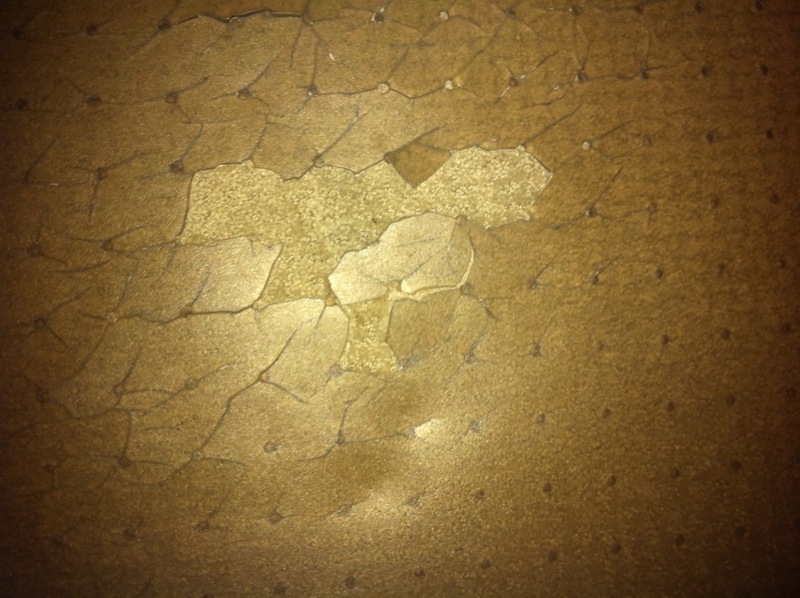 Ewwe - Dawkins is dusty inside. 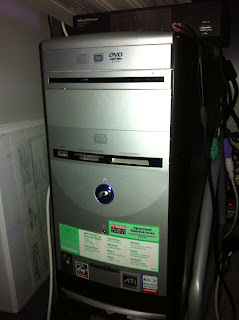 Lets take him out and dust him off (I learned long ago not to blow the dust out of a PC indoors…well OK not that long ago). Now I need to get the old drive out to see what kind it is. 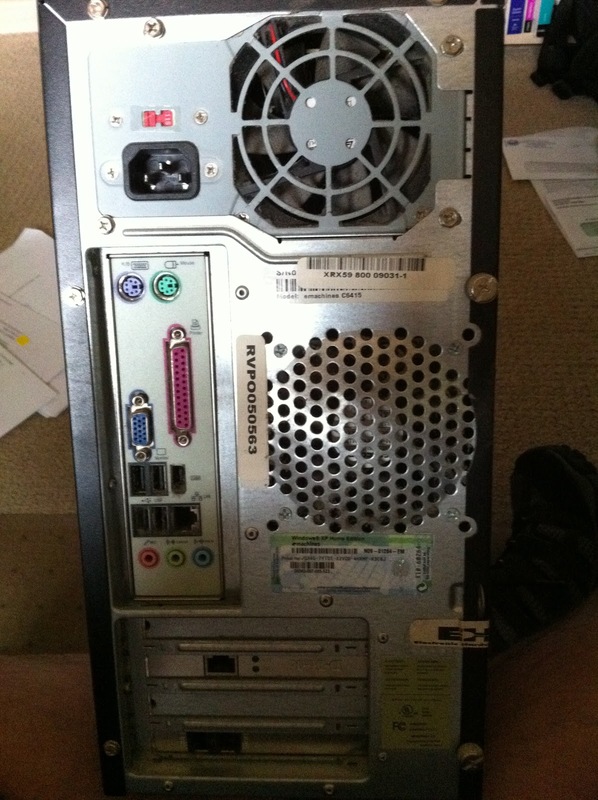 A Barracuda 7200 160GB drive! State of the art in 2004. We’ll get something bigger and just leave this as the boot disk. But before I do that it’s been years since I’ve done admin work on a linux machine - I need to figure out how to find and make the drive accessible once I get it in. A little internet research is in order. One of the really nice things about linux is the community of folks that will help you with stuff. A quick google search on “Adding a Drive to a linux system” turned up this site which provides exactly what I’m looking for (it seems anyway). Infotech is a great local computer store. They’ve got everything a geek (and post-geek like me) could want at reasonable prices. 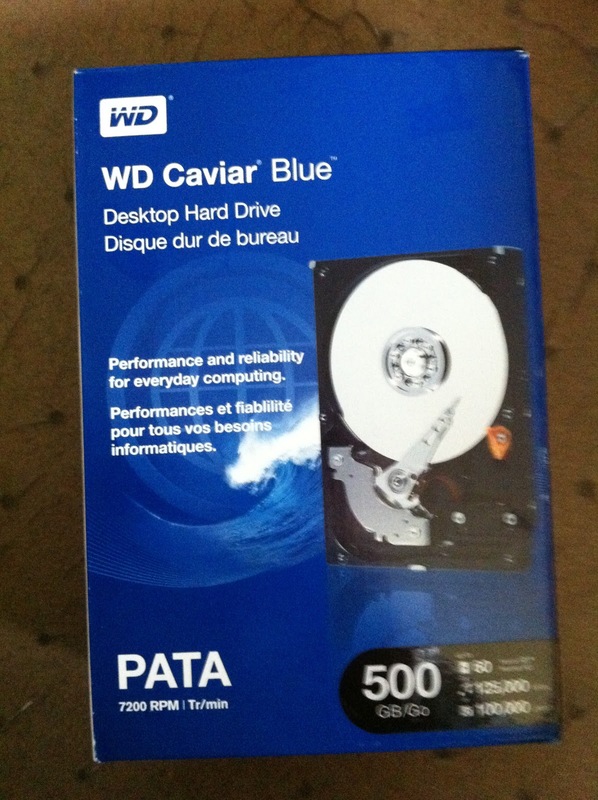 I found this 500gb WD Caviar drive for $80. 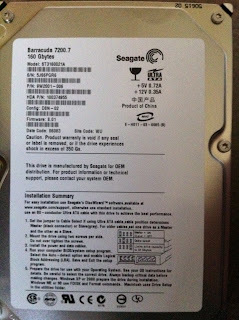 Drive installation was pretty easy. 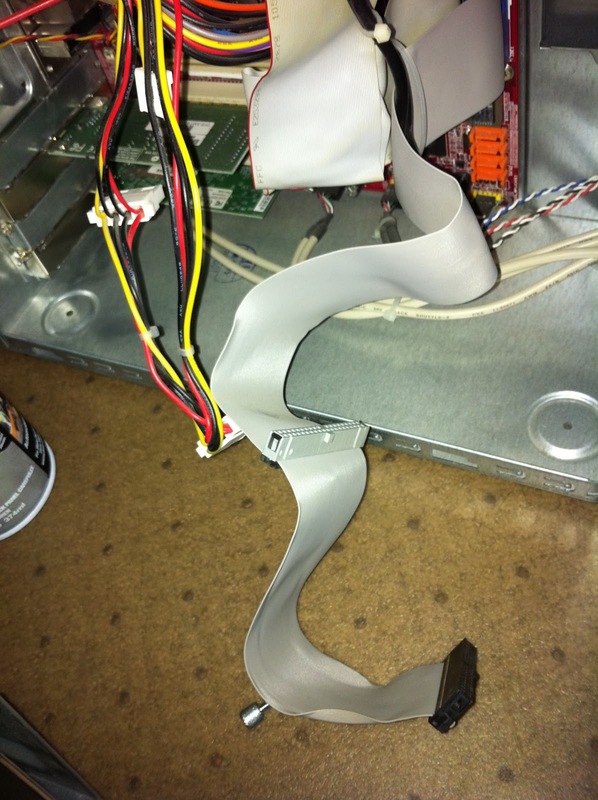 Just screw it in and attach the cables (power and data). I’ll let the pics speak for themselves. Only issue was making sure the jumpers on both drives were set appropriately. One had to be the master and the other the slave. I dug up the manuals on-line and set them appropriately. You use these little bits of plastic that are easily lost to set the role of the drive. I followed the instructions above mostly. 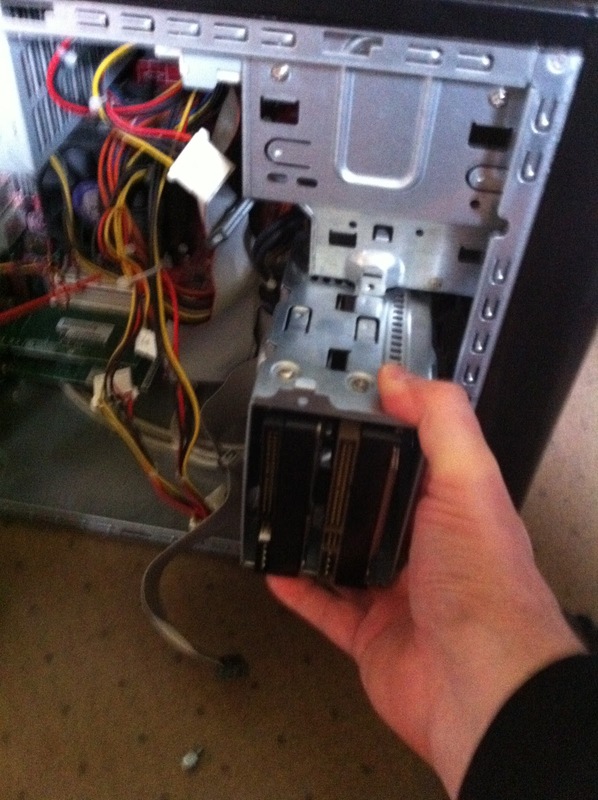 Only thing that didn’t work was setting the drive as an extended partition - it wouldn’t format if I did that. 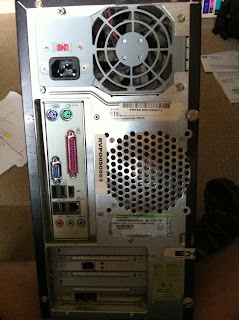 Googling around I found that if I set it to be a primary partition it all would work. Sure enough it did. I honestly don’t know the difference between extended and primary and I really don’t care. I’ve got 500 gig’s of extra space on my server! Changing scripts etc to take advantage of this new space. The last step was simply to adjust some scripts I had to take advantage of the new space. 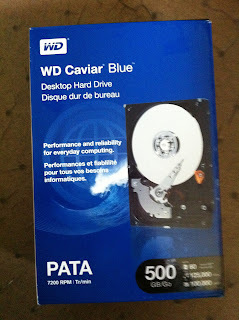 When backups are done I want the files stored on the new big drive. Didn’t take long and to be honest your situtation will not be the same as mine so it really wasn’t worth going into detail about. That’s it for this week. I’ve got several ideas for next week depending on the weather and my mood. 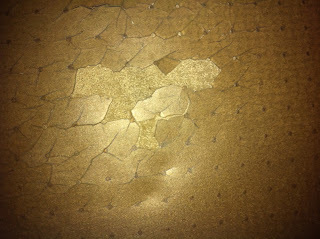 I have to start prep on the Garden and the picture below is my office floor mat (you’ll notice it’s breaking up). I was walking through Costco the other day and saw some bamboo flooring that was pretty cheap - I wonder if I can make my own floor mat? 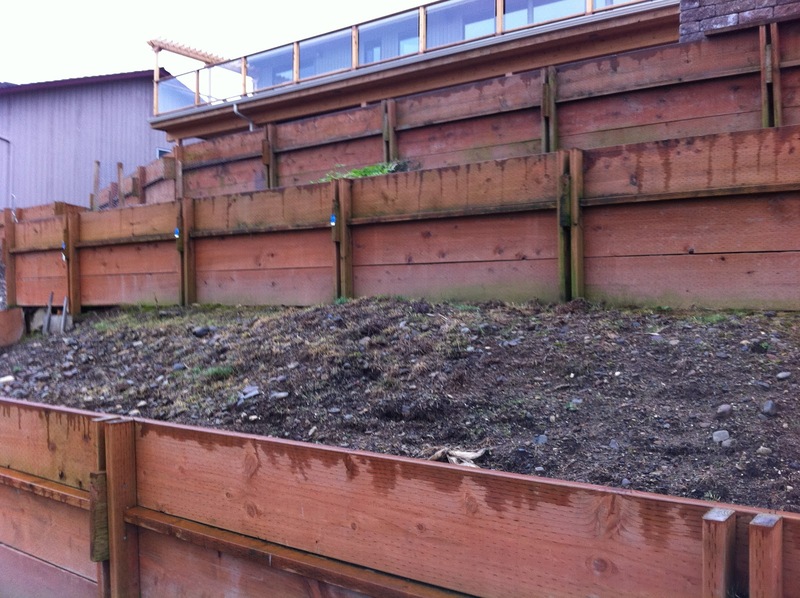 We'd finished our patio and putting in some tiers in our steep backyard in the late winter of 2009-2010. 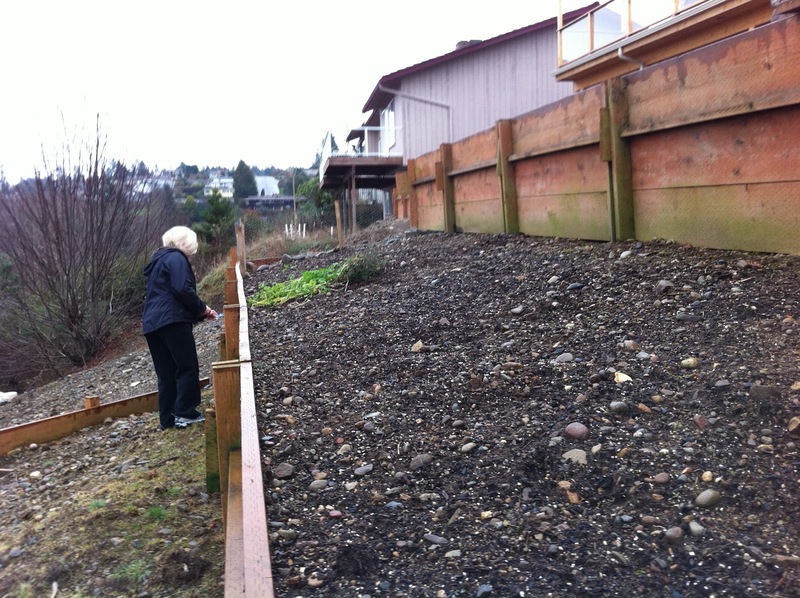 We still have more tiers to build on the other half of our hill...but there were enough. I wanted to do something with the tier space. My grandfather gardened and put up veggies for a family of 15 in his 20 by 40 foot backyard plot in downtown Trenton, New Jersey. He'd have at least 3 harvests a year and end up with figs, tomatoes, peppers, oranges (yes he had an orange tree in Trenton), tons of greens, squashes of all shapes and colors, onions, and even potatoes. I remember being in awe of the neat rows of tidy bushes of all sizes and colors. He maximized use of every square inch of his backyard. So last year I tried my first garden in twenty-five years. 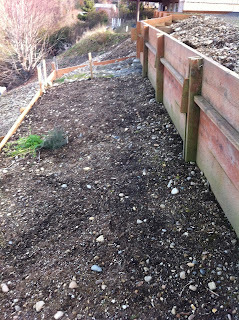 Previous attempts had been mostly failure but that was due to my laziness (I never weeded) more than anything else. In March (of 2010) I ran to Fred Meyer's and bought about $100 worth of seeds (a real hodge podge of stuff) just to see what might grow. I was pretty careful to document what I bought and what happened with each variety of seed. I started a notebook and numbered each seed packet so I could track everything about my new garden. I planted indoors early and guess what? The winter of 2010 held on and on and on and my indoor plants (most of them) fizzled out. 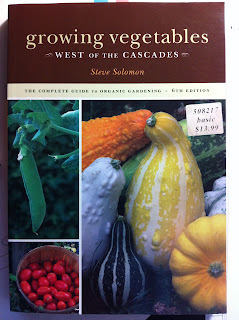 It discussed the unique climate I live in (Pacific Northwest), what works and what doesn't, and most importantly gave a city boy like me a clue about the importance of having a plan, planting schedules, weeding, cultivating the harvest, and soil preparation. 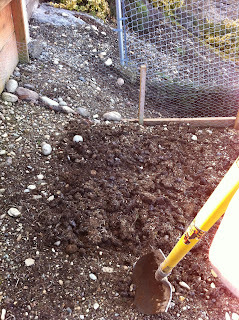 It created a real scramble for me (soil preparation - what's that?) and eventually I did get a decent garden out of 2010 but...well lets just say I learned a lot and could have done a lot better if I'd known 1/10 of what this book contains. I wasn't going to be able to recreate my grandfathers garden in the pacific northwest but is is feasible to have a low maintenance garden that keeps you in greens (and even gives you some canning veggies) for five months a year. This year is going to be different - I'm now a 2nd year amateur farmer and as part of my list of projects I've divided the garden up into (at least) 4 projects to write about: Planning, Preparation, Planting, and Maintaining. 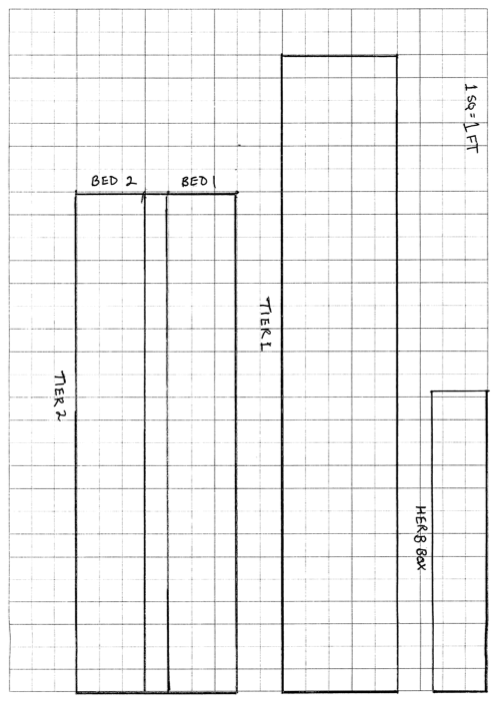 This entry is about the first of those 4 projects: Planning. The first step was to take inventory of last years seed. Seeds can last several years if stored properly. I'd carefully packed stuff up in a plastic bag, put a desiccant in the pack (moisture kills seed life) and stored it in the cool of my shed (heat is likewise not a friend of seed life). Yesterday I dug out my notebook with the carefully scribed diary of the garden and headed off to the shed to pull out the seeds. Aw Rats! Literally. 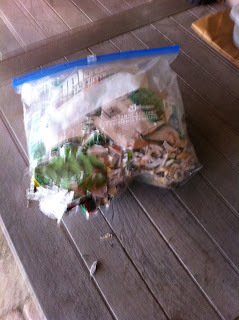 Rats had gotten into my seed packets and destroyed everything. I couldn't tell bush beans from radish seed. They'd even eaten the desiccant. Lesson learned 1 & 2: Write down the seed variety in addition to numbering the packets AND store the seeds in a sealable metal container. I have to start somewhere else. 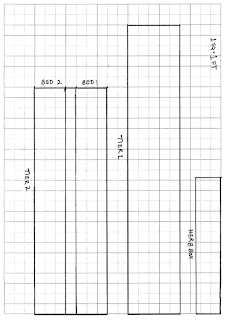 Gonna measure the tiers and build a template to lay out the garden. I'm doing a few things differently this year. First I'm expanding. I restricted myself to one tier last year (one of the few smart things I did). One tier was a manageable space in which to learn and experiment but yet provided me with the reinforcement of a real yield. This year I'm going to use the patio flower box for some herbs and expand to the second of three tiers. I'll leave the third tier fallow this year - I intend to rotate tiers every 3 years. 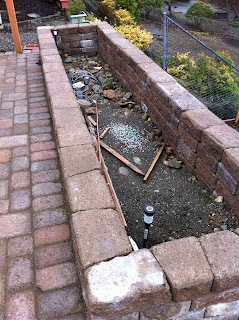 Here's the flower box - we'll plan herbs first and Fran will fill the front edge with some flowers. She does the artsy stuff - I'm into the meat and potatoes. Here's the tier I "farmed" last year (lovingly titled "tier 1"). It's primed and ready to go. We even did winter prep on the bed. That's Fran in the picture. 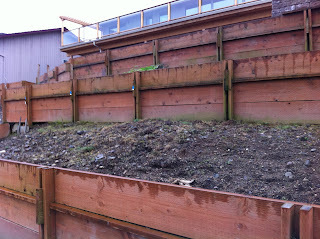 Looks like I need to power wash the retaining wall - another project. And here's the new tier ("tier 2"). Tier 2 is much wider than tier 1 and there's room for 2 beds. I've got to get the cap rail on my tiers this year (yet another project). This one I probably should have done some fall prep work on. Sigh - the 20/20 hind site of a year 2 amateur farmer. Here's what didn't grow: Peppers of any kind - I don't know why - I tried bell, habanero, seranno, pablano, and jalapeno's. Nada, zip, nothing. My neighbor got some great hot wax peppers and bell peppers so it's not the soil - it must be something about me. I also did corn which worked but I felt pretty silly taking up 20 square feet of garden for 20 ears when I can buy it at 10/1$ at the height of the season at the local farmers market. We'll let someone else to grow our corn this year. Here's what I don't know: Rosemary, sage, and oregano. I'd planted them on the edge of the garden and Fran accidentally weeded out my young plants. Oops. It includes the veggies mentioned above with the addition of fava beans and some experimental greens (mustard, cale and cabbage are my thoughts right now). 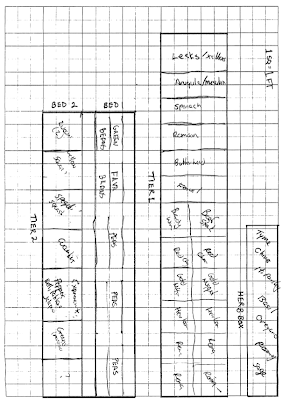 I've also got an experimental section (lower left above) that I might try some heirloom carrots - depends on the quality of seeds I can find. We're doing mint in a separate pot because it's a weed and will take over everything. This may vary based on the forecast but it is the plan at the moment. In June, July and even early August I'll put in more lettuce, other greens, peas just so I have them all summer long. 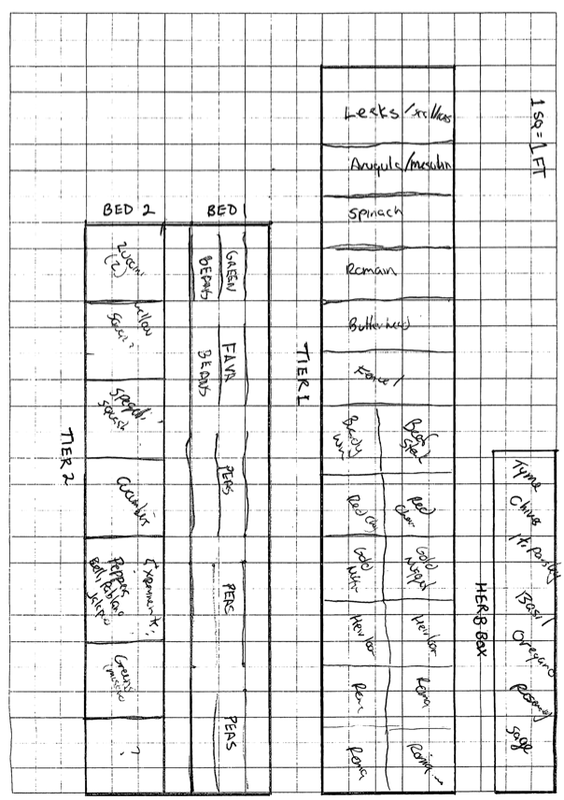 I may come up with a more rigorous planting schedule but (year 2 amateur speaking) I think having a flexible schedule and basing plantings on the actual weather will work out better than trying to be too rigorous a planner. I'll of course keep a journal of specific seed varieties and how things go. I'll also update this site with progress. I'm off to order seeds (on-line) now...I've been told I can get better seed quality on-line than I can at the Fred Meyer garden center store.